Australian coach Darren Lehman. Picture: Jason O'Brien/PA. DARREN LEHMAN has a new job at Cricket Australia’s national performance programme - only six weeks after resigning as his country’s head coach. The former Yorkshire batsman left his position as national coach on March 29, in the wake of the ball-tampering fiasco which was the scourge of Australia’s Test tour of South Africa and resulted in year-long bans for captain Steve Smith and his deputy David Warner. Darren was really keen to continue his coaching. What a great opportunity - having his expert skills in the areas that we need. The coach chose to resign despite being cleared of any wrongdoing during a saga which has resulted in a review of CA’s methods, and changes too at International Cricket Council level in the way instances of ball-tampering are policed. Lehmann’s new role is as an assistant to NPP head coach Troy Cooley, working alongside fellow former Australia Test stars Ryan Harris and Chris Rogers as they mentor the next generation of developing international players. The 48-year-old has agreed an initial appointment until October and will start on May 28. Cooley said: “I had a good chat with ‘Boof’ [Lehmann], and he was really keen to continue his coaching. What a great opportunity - having his expert skills in the areas that we need. 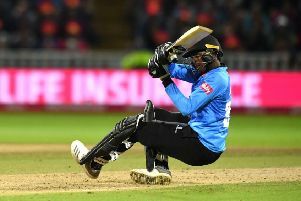 “He’ll work with our targeted group of NPS players ... they’ll all be able to talk to Darren about playing on sub-continental wickets, get his Twenty20 thoughts, one-day and long-format thoughts about how to play and how to adjust your training.